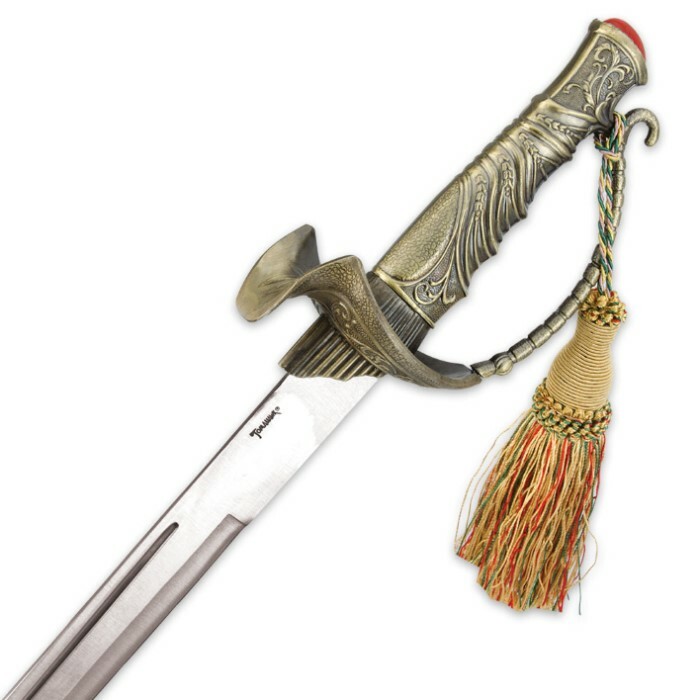 Inspired by the pirates who owned the seas centuries ago, this ornately designed short dress sword is a must-have for your true sword collection. The 14" stainless steel blade meets a fancy handle with a scalloped knuckle guard design compelte with a hanging rope tassel. The matching scabbard is made of a durable composite material with the look and feel of high-gloss burlwood. Cast metal accents add even more authenticity and historical presence to this inspired design. Tried this sword out in my regular practice routine. Didn't last 5 swings. Broke at the handle. Not recommended for actual defense combat, but a rather good costume and collector's piece. GREAT blade for the price! Fast delivery. Will recommend True Swords to the rest of my pirate crew! Nice sword. Perfect length. Relatively sharp. The fit to scabbard is excellent on mine. I like everything about it EXCEPT the guard. I must force my hand in which makes it uncomfortable. To be honest I must say my hands are on the large size. I am over six feet tall and three hundred pounds. So I did not take a star away. But back to the sword,,,If you are looking for a mid sized (short) sword with nice style and solid construction I suggest you give it a shot. I have a nephew that will probably end up with this because of the grip size but I have had it for a month and just cant give it away yet. I like it just that much. Beastly dagger exceeded expectations sharper than expected and has over all good weight and is sturdy. 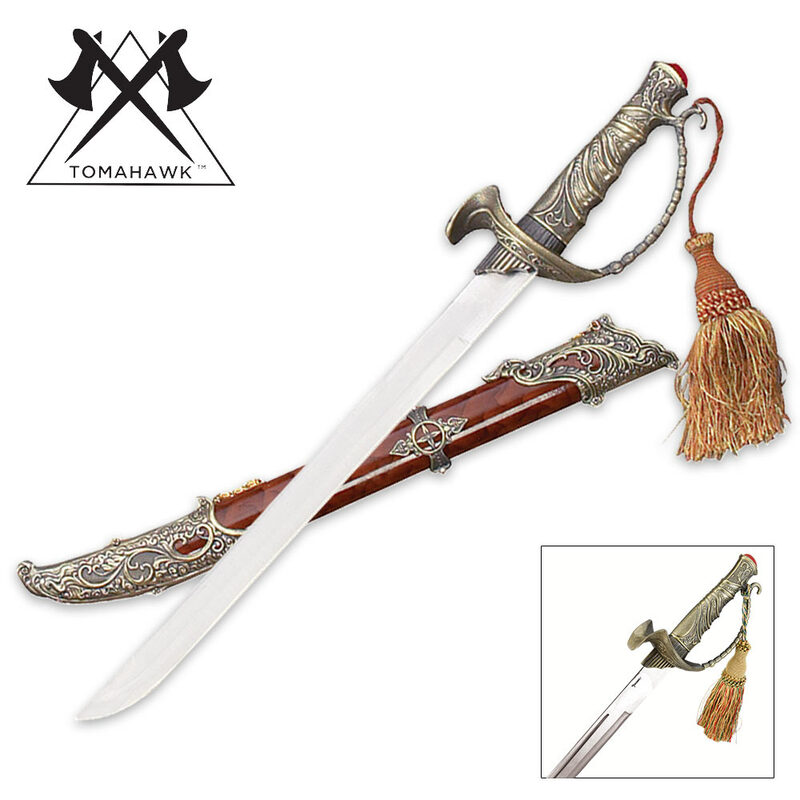 THIS IS A NIFTY LITTLE SWORD & THE ORNAMENTAL SCABBARD IS COOL TOO! MY ONLY COMPLAINT IS THAT IT IS HARD TO DRAW FROM THE SCABBARD; IT IS VERY SNUG! ALL IN ALL THIS IS A NICE PIECE FOR THOSE WHO LOVE PIRATE STUFF AS I DO! I got this sword to add to my pirate collection and was very impressed with the quality for the money. The only problem I saw was the jump rings connecting the chain, were too light duty. After I replaced them with stronger rings everything was fine.